It has been a while since I have done a mojo Monday sketch. After a long work day, I needed something quick and easy to escape to for a few minutes. A card! Perfect solution! I went Saturday and hung out with a great group of scrappy friends. After not seeing them for nearly 2 years, it was great seeing them! Sometimes being a mom and wife keeps us so busy we forget we need friend time too! Being with the SOTTS (sisters of the traveling scraps) again reminded me how much I love each and every one of them! Emily was busy with her band ensemble group this evening. They played at the 4 - H banquet. They have been playing together for 3 years now. Over the years, they have become good friends. Scrapping the team picture from Tyler's senior year made me reflect back on friendships. A few of these boys have played ball together for years. They have built up a great friendship. I have a friendship with the SOTTS built over years and Emily has a friendship with the ensemble group built over years. These friendships are built because of a common interest in something. Moral of the story is to put yourself out there and be a part of something. That is where the best friendships are built. When you have a common interest in something it takes away some of the social anxiety a lot of us have. You already have something to talk about. This is the last team picture for baseball I have to scrap for Tyler. Boo!!!! 14 years of sports sure flew by! 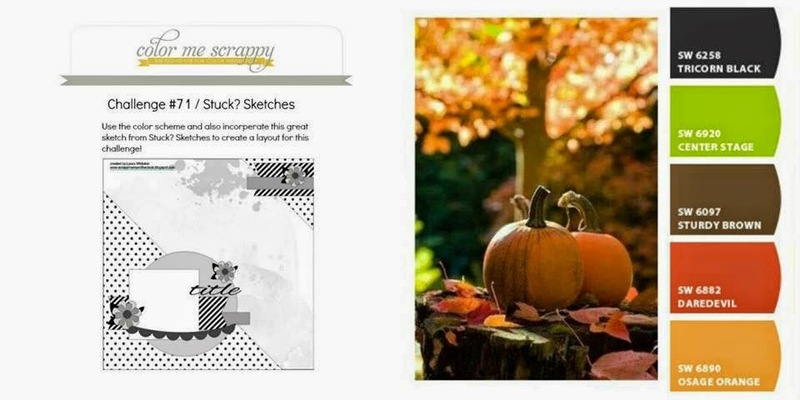 I used one of the sketches in this months Create magazine put out by Create Scrappers. They put out a monthly digital magazine and for FREE. You can't beat that! For the added little details that make the layout, I did some hand stitching and stenciled a banner using Gesso. I then used a silver sharpie to color the Gesso'd banner. Yay!!!! Finally had a little time to add the finish touches. This is the part that pulls the page together. As mentioned in my first post I used 3 different challenges for my inspiration. 1. http://123getscrappy.blogspot.com. I used the middle row of the tic tac toe board. 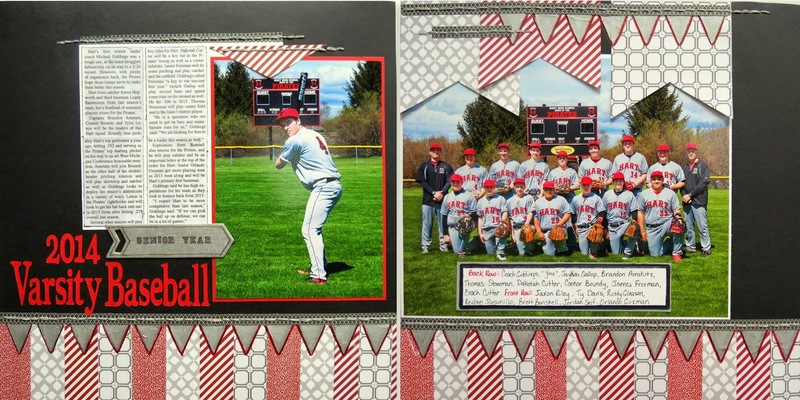 "Polka Dots" inspired the Circles and embossed stamped circles behind the picture. "Pumpkin" inspired the color. Used pop dots under the butterfly. I would have used them under the journaling strips but I didn't have any thin enough. 123getscrappy is also looking for a 2015 design team! I have yet to cross that off my scrappy bucket list, so I will humbly apply. You never know! Follow the link if you would like to submit your projects as well! 2. http://scrap-challenge-yourself.blogspot.com The affirmation on my page is about our Family. Often times our family is the ones we treat the worst. Not because we intend to, they just get the brunt of all frustrations. We can all use a reminder to do all the things stated here. 3. http://color-me-scrappy.blogspot.com I used the sketch and color scheme for layout and color inspiration. This sketch has a lot of possibilities!! When adding the details, To pull the page together, stitched a frame around the entire page. Added a fabric border misted with brown ink under the bottom of the picture. I inked some chocolate ink over the stenciled gesso circles to tone them down a bit. Then doodled a circle around them.Added the piece of left over pattern paper. Amazing all the pattern paper came from one 4 x 6 piece. I still wasn't entirely happy with the circle areas, just felt to bold. I wanted something light and airy that didn't totally cover them up, but toned them down as well. I quickly cut some circles from Tulle layered them up and voila! Pretty little tulle flowers. Love that you can buy a nice size roll for $1 at Dollar Tree! Cheap and fun, right up my alley! I really enjoyed working with these challenges! Great thing about challenges is they push you out of your comfort zone while inspiring you at the same time. Win, Win! Thanks for stopping by and Happy Saturday! It is a pajama kind of day here in the Highland house. Tyler and his Girlfriend have plans tonight, Emily is going to a friends, Zane is hunting, then going to a buddies for steak and male bonding. I will be embracing the quiet alone time! "Page building" would probably be a more appropriate title. Since I am building the page up through layers and texture and not breaking it down....... A couple years ago a friend of mine said to me "I want you to teach me how YOU scrapbook". My response was "I can't. I don't know how to teach that, I just build the pages". While trying to figure out how to get back into blogging over the last few months. I wasn't sure what I wanted my blog to focus on. It finally occurred to me today. Why don't I show the process as I put together my pages. Take pictures and explain each step instead of just showing pictures of the end results. I often do a layout over a few days. It just isn't feasible to do a project start to finish, that is if I want to sleep. Tonight, I added a few more elements to the family layout I started in "page breakdown part 1". For the title I did a Pinterest search for a family quote that fit the affirmation challenge requirement and was fitting for the picture. I used some Canvas letter stickers by Little Yellow Bicycle I found on clearance at Hobby Lobby for word "family". I moved the corner piece of pumpkin colored paper to a different angle. It just seemed to work better for me. I have 2 containers of Gesso. One is regular and the other I added some cornstarch to so its more like a texture paste. Using this fun stencil, I added some of the Gesso paste with a spatula. Sticking with the rule of 3. I added some stenciled Gesso to 3 different areas. I also like to keep the 3 in a visual triangle. If you draw imaginary lines from one like element to another, you would have a triangle. This is a good guideline to maintain balance. Now it needs to sit overnight for the Gesso to dry. Tomorrow, I will add some color to the Gesso and maybe a border around the page to pull it all together. What do you think? Do you prefer I show the process or just the finished project? I would really appreciate your input. I went looking for some challenges today for a little inspiration. Whenever I feel like I need a little creative jump start, challenges are the answer. I found these 3 challenges that I am going to base my layout around. 1. http://123getscrappy.blogspot.com. Use the items in 1 row on the tic tac toe grid for inspiration. 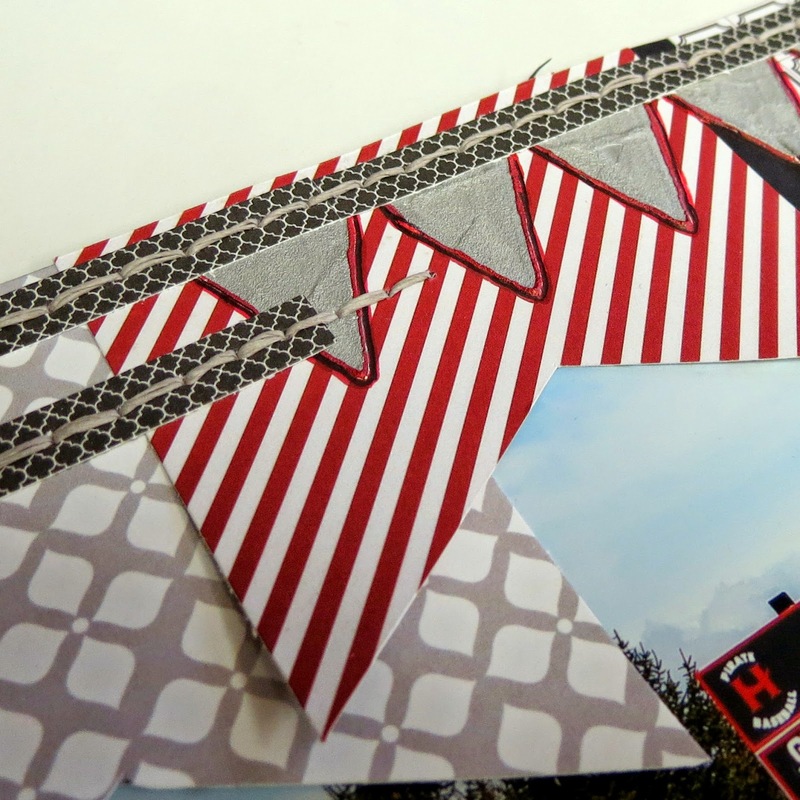 2. http://scrap-challenge-yourself.blogspot.com. Scrap an Affirmation. Must include yourself in the photo. 3. http://color-me-scrappy.blogspot.com Sketch and color challenge. Between the three challenges, I have topic, product inspiration and sketch and color combination. I started by pulling out the paint colors to match the colors in the color challenge. This gives me a visual at my fingertips when selecting what to use. The background is light brown. My work area isn't the best for taking photographs. I used a piece of the deli paper I had made a gelliprint with last week. Then penciled in where the picture will go. I then heat embossed the fun circles around the frame. I stamped with a darker shade of green in a couple spots to add a little visual interest and different texture. This pattern paper was just a 4 x 6 photo mat from my stash of scraps. Trimmed it down to make the banner. Since just the edges will be peeking out under the picture, you can cut it in 2 so it's long enough. This is a great way to use up smaller scraps. The picture is down! Love this part. I used a plain piece of deli paper as a mat. I really like the zig zag edge on the deli paper. The borders were added before I printed the picture. I added just a little darker brown inking around the page and picture to add a little more brown from the color palette. Hopefully, I have a little time to add some more details tomorrow. It's going to be another 50 + hour work week. Just a few more weeks and we will have full staff again. So grateful for that. As much as I like the OT, this girl is tired! A few months ago I offered to make a handmade journal for a silent auction with proceeds going to St. Jude's. Have you ever made something and have to keep touching it and looking at it. That is how I feel about this little journal. It was just fun to make! I literally spent the entire day on this. We totally ordered pizza for dinner and I am still in my pajamas. I don't even feel guilty because this work of art is raising money for a great cause! That is, if someone at the auction sees the beauty in this little gem like I do. I am very new to Gelliprinting and not willing to drop $60 for a real gelliplate, so I made my own using a recipe from www.thefrugalcrafter.wordpress.com. I am extremely happy with it so far and was able to make a 13" x 13" plate. I chose 5 colors of paint and did 5 prints of each one. 4 using copy paper and 1 using deli paper. I also did a few sheets with 2-3 colors on them. I kept them pretty simple without a lot of stenciling and such since they will be used to journal on. Now that is a pile of happiness! 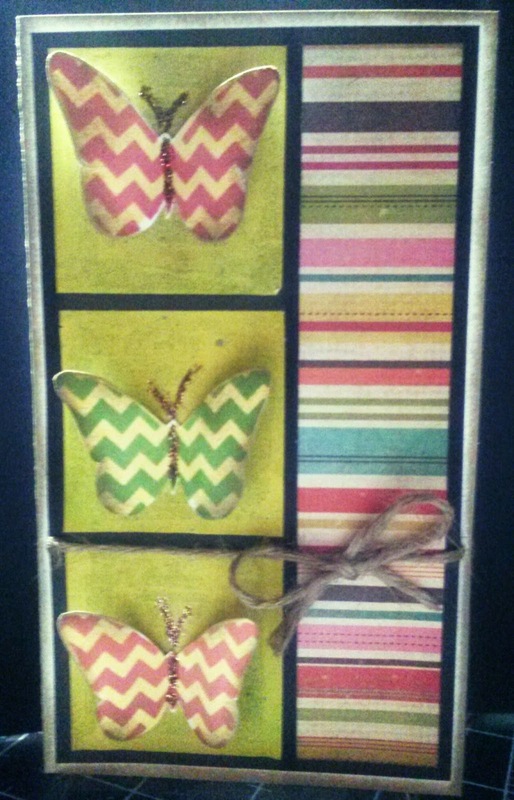 I used one of the deli paper prints and washi tape to cover some chipboard covers. I stole the chipboard off the back of a watercolor paper tablet. Nice and sturdy! Gave all the papers a nice crisp fold. I added Gesso, layers, colors, ribbon, stamping, all kinds of stuff until I was happy with the results. This is really my first true mixed media creation. LOVE it!!!! For the binding, I did a coptic book binding technique I found on YouTube. The inside pages ready for some stories, memories and thoughts. For some reason my gelliplate has this little wishbone shaped scrape on it. So a lot of my prints end up with this funny little "v" on them. I figure just adds to the character and handcrafted effect.